I have thoughts and opinions about last night’s Supernatural, but I think I’m going to give them some time to settle – I may blog about it tomorrow or Monday. But rest assured that it’s coming. Oh, boy, is it coming. So, in the meantime, I’m going to spend a few paragraphs talking about things my friends and family are up to. You’ve probably seen some of these links before – hell, in at least one case, you might have found this blog through the site I’m linking to – but hopefully you’ll discover something new nonetheless. 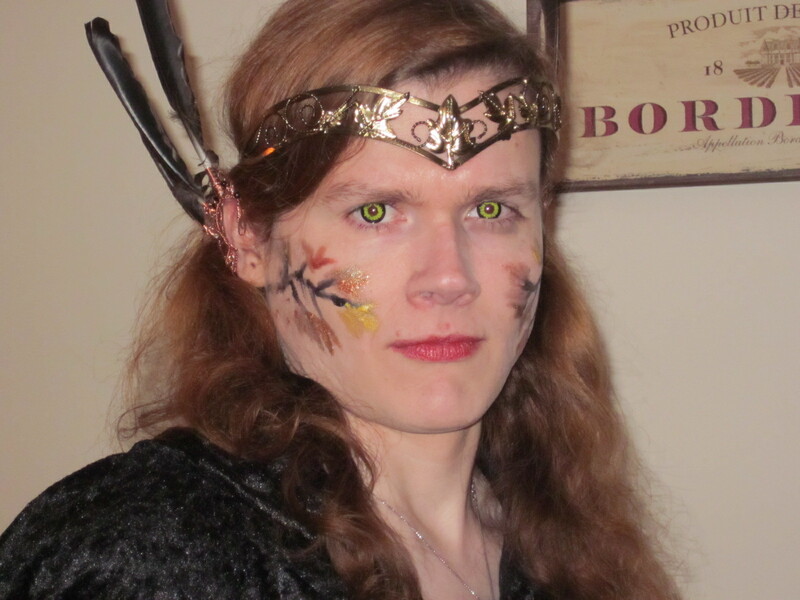 My costume for Halloween 2011: Queen of the Autumn Fairies. Ears by Alanya Divine. Photo by Katie Hallahan. In yesterday’s Fangirl Fridays post, I mentioned my sister, Alanya Divine. Alanya’s an incredibly talented jewelry-maker who makes a number of unique, intricate pieces out of copper, silver and assorted stones. She also specializes in ornamental “elf” ears accented with stones, clock parts, feathers…you name it. She made a pair of truly lovely copper ears ornamented with black feathers for my Halloween costume last year (I’m afraid they don’t fit perfectly in the photo; she’s since adjusted them to a much better fit) and I can’t wait to find another use for them. You can find her Etsy shop at www.etsy.com/shop/belethil; while she does have her own dedicated site, it’s not quite finished yet. Alanya is absolutely dedicated to her craft, and I’m so, so thrilled and proud to see her enjoying such success. I’ve mentioned my friend Katie a few times (unsurprisingly, since we’re in the same writing group, we both go to Women in Games Boston, and we’re gaming buddies and occasional creative partners), and I’ve linked to her blog each time, but in case you missed it, here it is again. Katie’s an incredibly bright, funny, snarky lady, and I always enjoy working with her. She’s also a vital part of Phoenix Online Studios, which recently produced The Silver Lining, a fan-made sequel to the King’s Quest series, and she and her colleagues are currently hard at work on an original game called Cognition: An Erica Reed Thriller. I’ve been privy to some of her other creative work, and while it’s not really my place to talk about it, I’m sure you’ll be seeing a lot more of it in the years to come. I also want to give a quick shout out to a couple other Internet buddies: Maverynthia and I have been following each other on Twitter for a while now, and most recently, she was kind enough to write a loose companion and counterpoint to my own piece on the used product market. (I say “loose” because I would not describe it solely as a companion to my piece – it’s her own article, offering her own unique perspective, and she was gracious enough to link it with mine.) Then there’s Kate Cox, an independent blogger and guest poster on The Border House who has recently joined the staff of Kotaku. Once again, we’ve been following each other on Twitter for some time, and she’s an awesome lady and a great writer, and I’m looking forward to reading her future work. Maddy Myers is also mainly a Twitter/Facebook friend, though we did finally meet in person at this year’s Arisia (where she sat on the Women in Gaming panel and wore an awesome Gargoyles shirt that made me kinda jealous – oh, Elisa Maza, you are so getting a Fangirl Fridays post of your very own). She’s a writer for the Phoenix, specializing in games and gaming culture, and I cannot recommend her highly enough. Last but far from least, Amanda Cosmos is a friend and former colleague of mine, currently working at Irrational Games. I have to admit that I am really really terrible about following what she’s up to, but I keep tabs on her on (say it with me) Twitter and see her every so often at Women in Games Boston, and she’s also very cool. The truth is that I am blessed with a whole lot of amazing friends and there’s no way I can keep track of them all – so if I’ve passed you over, I’m sorry! I’ll try to get to you next time, and please feel free to call me out in the comments. As for the rest of my readers, I hope you follow up on these folks – they’re all incredible in their own unique ways, and I’m sure you’ll find something you like among their work.